Centuries back wine makers in the fertile Mediterranean region crushed grapes to extract the juice which was ultimately used as a wine. This process involved only the fleshy part of the fruit and left the seeds untouched. This led to accumulation of a huge amount of grape seeds that was left as a by-product of the wine making process. At that time, these seeds were of little value to the wine industry and were used nothing more than as a sub standard feed for animals. Extracted from the seeds of grapes, grape-seed oil offers an effective and convenient method for improving skin tone. However, it was during the industrial revolution that the value of grape seed was actually noticed. This led people to take notice of its value as a cooking medium. Although the amount of oil contained in the grape seed is extremely small but with the use of advanced high tech machinery, the problem faced of extracting the oil previously was over come. This technical break through gave rise to one of the most lucrative industries and the legend of grape-seed oil was born. From an unwanted by-product of the wine making industry, the oil extracted from grape-seeds was now at par or even superior than popular cooking mediums like sunflower oil, corn oil and even canola oil. It wasn’t long before the oil extracted from grape-seeds found its way into the cosmetic industry. In fact it is now a natural ingredient in most soaps and cleansers that are used by people all over the world. The light texture of the oil makes it a favorite as it is extremely well absorbed into the skin and is a must have in massage parlors. This is because; grape-seed oil does not leave the skin feeling too oily but instead leaves behind a thin film without staining clothing. Taking full advantage of its skin tone improving properties, the cosmetic industry has used this oil in natural moisturizers, as a soothing lubricant in shaving creams and also as an ingredient in anti-aging creams. The extreme beneficial property offered by grape-seed oil as an effective topical application in improving skin tone led the use of this oil in the acne removal market. Unlike the application of cucumber or chlorophyll, grape-seed oil provided better results when applied topically to the skin. But the point to be kept in mind is that grape-seed oil can precipitate disastrous results when consumed. 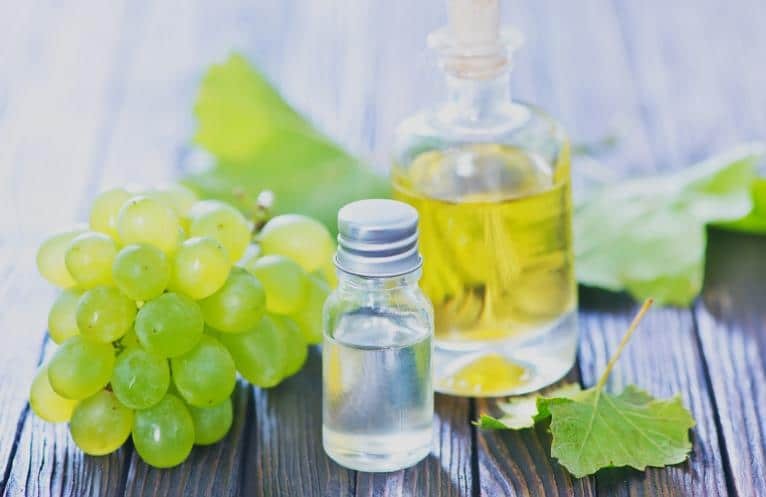 The effectiveness of grape-seed oil in getting rid of acne and improving the tone of the skin can be attributed to its ability in provide the cells in the skin with linoleic acid. In fact it has been found that this property of grape-seed oil is far better than the much hyped olive oil. Linoleic acid is among the many fatty acids abundant in nature. It is a polyunsaturated fat and is better known as omega 6 when it is available in foods. There are other fatty acids of the same nature like linolenic acid, stearic acid, oleic acid and palmitic acid. But what is disturbing is the over consumption of linoleic acid by almost every individual living in the west. And this has happened because of using vegetable oils as a cooking medium for over a century now. What this over consumption of linoleic acid does is that it brings about undesired effects in the body as well as the skin as mentioned earlier in this write up. Too much linoleic acid increases the activity of the immune system while at the same time curbing the beneficial effects of omega 3 acids and weakens the membrane of the cells. All of these effects are not desirable in the body and skin. However, using grape-seed oil as a topical application shows great efficacy in improving the overall skin tone.